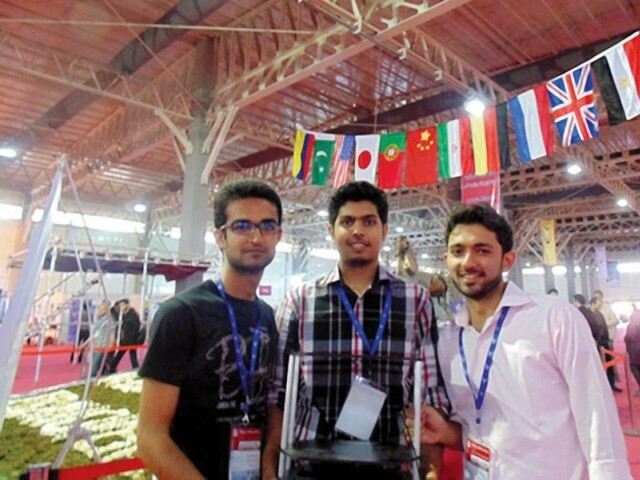 KARACHI: The ‘Chotu’ – a robot built by a three-member team of the Institute of Business Administration (IBA) – hacked its way to third position, sweeping aside Chinese and German rivals, in the RoboCup Iran Open 2014’s @Home League. The competition, held in Tehran from April 9 to April 11, drew more than 2,000 students from 22 countries who contested in four major domains, each with a number of leagues and sub-leagues. The Pakistani team, Karachi Chotu, comprised three students, Imran Hemani, Safeer Hussain and Nabeel Zahid Rajput, under the supervision of IBA Artificial Intelligence Lab head Dr Sajjad Haider. This was the first time that the team qualified for the competition’s @Home League, which aims to develop service and assistive robot technology with high relevance for future personal domestic applications. Of all the five teams that qualified from among 11 registrants in the league, the two Iranian teams bagged the first and second positions, followed by the Pakistani team that outplayed its Chinese and German counterparts.